SEAN: It’s rare that I dive into BL, much less make it a Pick of the Week. And I am, I admit, really excited for delinquent/cat manga Nyankees. But the cover and premise of 10 Dance just looks SO good that it’s turned my head. I’m buying it, and it’s my pick this week. MICHELLE: I absolutely concur. Anytime we get BL about grown men pursuing their professional goals, I will be 1000% here for it. ASH: That all pretty much sums it up for me, too! 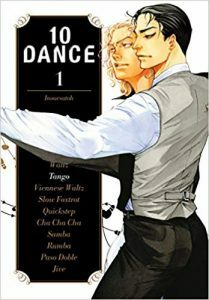 I’m prepared to be delighted by the debut of Nyankees (and the most recent volume of Monthly Girls Nozaki-kun), but it’s 10 Dance that has really caught my attention this week. MELINDA: I only have eyes for 10 Dance. Sorry, cats!